Two men have appeared at a military court martial over the deaths of three soldiers during an SAS selection march. 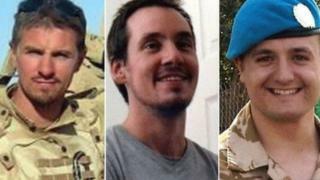 L/Cpl Edward Maher, 31, L/Cpl Craig Roberts, 24, and Cpl James Dunsby, 31, died after a 16-mile (26km) trek in the Brecon Beacons, Powys, in July 2013. The serving officer and former warrant officer - who can only be referred to as 1A and 1B - deny negligence. They were in charge of the exercise which involved soldiers carrying up to 27kg (4st) on their backs. The march was over difficult terrain and had to be completed in under 8 hours and 45 minutes. L/Cpl Roberts from Penrhyn Bay, Conwy county, and L/Cpl Maher, from Winchester, Hampshire, suffered heatstroke and died on the exercise. Cpl Dunsby, from Trowbridge, Wiltshire, died from multiple organ failure more than two weeks later at Queen Elizabeth Hospital in Birmingham. 1A was a captain in command of the exercise while 1B served under him as a warrant officer second class, but has since since left the Army. The court martial in Bulford, Wiltshire, heard they were in charge of risk assessments and directing staff on the ground. Prosecutor Louis Malby QC said: "The charge against the defendants is that they were negligent in their duty to plan and conduct the exercise safely in relation to a well know risk - heat illness." He said the prosecution was not looking to hold the defendants accountable for "systemic failures" within the Ministry of Defence, which were highlighted in previous investigations, but was about "personal failures". The court heard the exercise took place on a particularly hot day and there were also a number of non-fatal casualties. "The risk of heat illness is not something the defendants adequately prepared for," said Mr Malby. He described the risk assessment as "a rubber-stamping exercise" and lacked "the care and diligence that commanders responsible would be expected to make in the circumstances".